What Was the First Spacewalk Really Like? About six and a half hours after the landing, Neil Armstrong opened the hatch of the four-legged lunar module and slowly made his way down the ladder to the lunar surface. His initial footprint was photographed. A television camera followed his every step. Buzz Aldrin joined Neil Armstrong on the moon surface. The men bounded like kangaroos in the low lunar gravity, one sixth that of Earth’s. 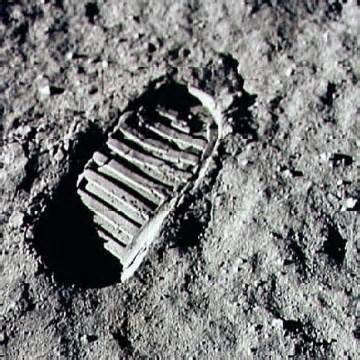 The moonwalk lasted 2 hours and 19 minutes, long enough to let the astronauts test their footing in the fine and powdery surface — Mr. Armstrong noted that his boot print was less than an inch deep. Human footsteps are noiseless on lunar soil; never to be erased for perhaps a million years. This entry was posted in Uncategorized and tagged astronauts, boot print, Col. Buzz Aldrin, Earth, first human footprint on the moon, footing, footstep, gait, human footprints, human footsteps, lunar gravity, lunar module, lunar soil, lunar surface, moon, moon landing, moonwalk, Neil Armstrong, spacewalk, terrain, terrain of the moon, walk. Bookmark the permalink.